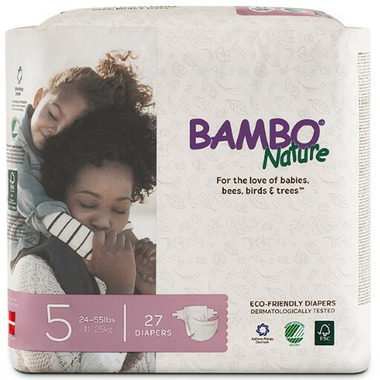 Bambo Nature disposable diapers are more than just eco-friendly—they’re safe and offer supernatural performance! Free of harmful chemicals and all known allergens, Bambo Nature diapers have a unique three-layer design and super-absorbent core that can stand up to multiple wettings—even overnight. Combined with a fully breathable backsheet, baby's sensitive skin will stay dry and comfortable. A wetness indicator changes colour to indicate when a change is needed and their flexible, waistband and latex-free leg cuffs help diapers stay in place while maximizing movement so your child can boot, scoot and boogie all day long. The diapers are approximately 80% biodegradable and 99% compostable, all wood pulp is derived from sustainable tree farms, the manufacturer has released a life cycle assessment proving a reduced amount of emissions and almost no waste. Materials: Textile back sheet of poly-propylene (PP) and polyethylene (PE). Absorbent of polyacrylate (SAP) and cellulose. Inner side of non-woven PP. Acquisition layer of non-woven (PET/Co-PET). Hook-and-loop fastening of non-woven (PP/PE). Glue made of synthetic rubber - no optical brightner added. Wetness indicator. Elastication made from elastane. No perfume or lotions have been added. Great diaper. Sung and soft. Simple design. Love these diapers! My little guy was breaking out in a rash from other â€˜naturalâ€™ diapers. Most other brands contain corn and wheat. Iâ€™m so thankful to find a diaper thatâ€™s allergen free, has great absorption and is also super soft. I've been using these diapers for over 2yrs and absolutely LOVED them. Zero leaks and great product. Unfortunately, they rebranded them and now they are softer, and thinner but leak. Every. Single. Night. We have all lost so much sleep over this issue and I'm very disappointed. The original real packed diapers were amazing. These light packed ones are terrible. I now have to look for another "natural" diaper. So sad. Bad choice Bambo. I am sooooo happy they sell these now!! These are the BEST disposable diapers out there. I use these when I'm not cloth diapering. They fit amazing, are as natural as you can get, don't smell and they allow babies skin to breathe. My favourite diapers and worth the money.